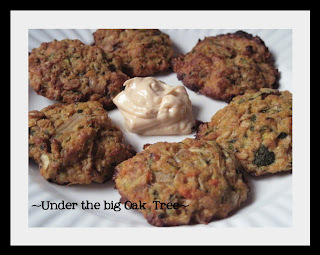 Under the Big Oak Tree: Baked Veggie Fritters: a new favorite! Last week, I showed you our small veggie garden. Tiny, huh? Well, like I said in that post, it's a trial run for us first time gardeners. In addition to the trial garden, I've also been on the look out for different ideas for using vegetables. If next year's garden is bigger and better like we have planned, I don't want us to get sick of looking at (let alone eating) another squash, zucchini, tomato, etc. GetHealthyCheap.com is one of my favorite places to check out new recipe ideas! For me, though, recipe blogs tend to be like my cookbooks that live in a closet in my basement. I flip though the pages and never get around to trying the recipe. I have good intentions, but I guess I'm easily distracted, too! The "I want to try this" recipes are often forgotten! 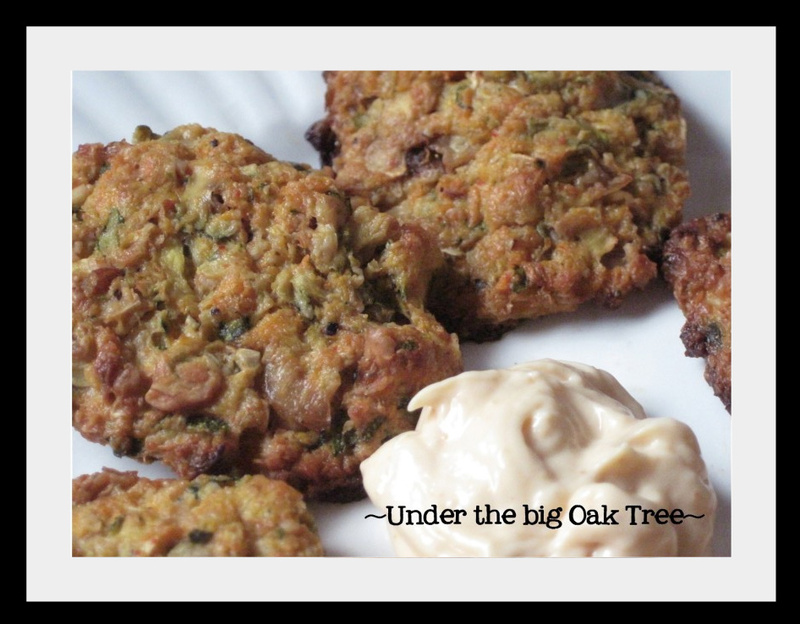 Sooo not the case with Julie's Baked Summer Squash Fritters! Once I saw that recipe, I just KNEW I had to make them! Especially since I just picked one zucchini and one summer squash from our trial garden! Shred summer squash, zucchini and carrots. Add shredded vegetables to a strainer. Place a large bowl under the strainer. Sprinkle the shredded vegetables with 1 tsp. of salt. Saute onion in olive oil, add garlic. Pour liquid from the bowl under the strainer. Use the back of a ladle to press as much liquid as possible from the vegetables. Sqeeze with hands to remove more liquid. Add the shredded vegetables and the onion/garlic mixture to a large mixing bowl. Bake at 400 degrees for 30 minutes on a foil covered cookie sheet that's been treated with cooking spray. Use a food processor or hand grater to shred the veggies. I used my vintage Tupperware food grater, because I don't know how to use the grating attachement on my food processor! I shredded and drained the liquid from the veggies the night before and placed the covered bowl in the fridge over night. Squeeze as much liquid from the veggies as possible. This will help your fritters get crisp in the oven. I added the roughly ground oatmeal to the mixture because I couldn't seem to get as much liquid out of the veggies as I would have liked. Not sure if I just didn't squeeze enough out or if it was because I stored in fridge overnight. Either way I really liked the addition of the oatmeal. I used 1/4 cup less of the parmesan cheese than the recipe called for since I'm not overly fond of parmesan cheese. Also, I didn't use a fancy parmesan, just the one in the green container in the supermarket. I made small patties, each one approximately the same size. Think silver dollar pancake size! Since I made these in such a small size, we had a lot of little fritters. We ate these hot as a side to our main meal. For a quick and healthy lunch, I served them cold with a bit of Chipotle Mayo for dipping! These would be great to serve as an appetizer at your next party! Perfect for your friends and family that are vegetarians, watching their weight or just looking for healthier options! 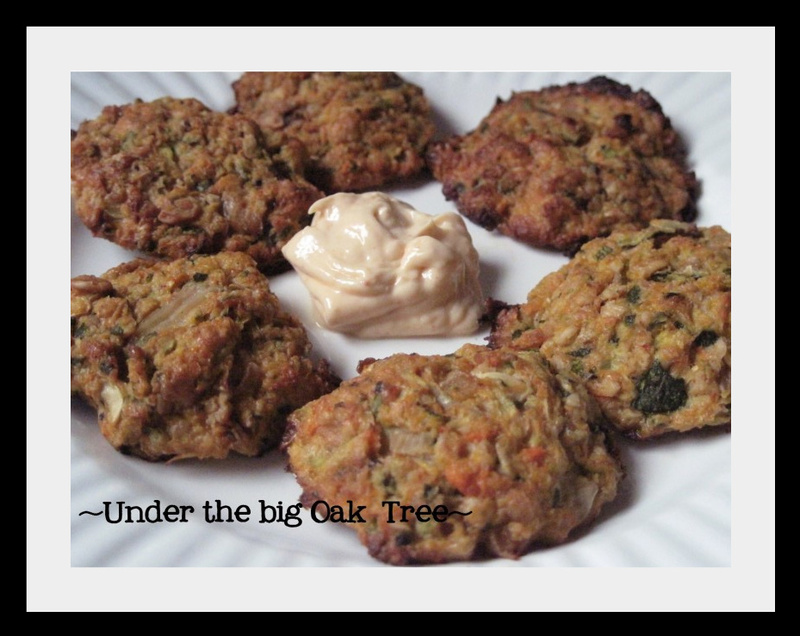 These veggie fritters were amazing! I thought for sure that this recipe was going to be something that Joe wouldn't go for at all. But he fooled me! I was in the middle of making the rest of dinner when the timer went off on the oven. Joe was just walking in the door from work at the very same moment, so I handed him the oven mitt and asked him to remove the cookie sheet. He took them from the oven and ate one immediately! I'm surprised he didn't burn his mouth! He ate several before we even sat down to dinner! This recipe is definitely a keeper! I'll be making them again very soon! Since this is Julie's recipe (just slightly adapted), I thought it more than fitting that I link this to her weekly blog party, Family Food Fridays! Ooohhh these look yummy! Especially since I am a nut case for zucchinis and summer squash. I've been finding so many recipes and this one looks just so healthy too! Thanks for sharing! This is terrific. I am working on not making fried food and I have not had much luck with patties. I have to try these and see what happens. Thanks for linking this gem to My Meatless Mondays. I want to welcome you to My Sweet and Savory and thank you for linking this wonderful recipe up for My Meatless Mondays. I was reading your menu, for this week, and it seems you are making headway in meatless cooking. I do eat meat, sometimes, but I really like the meatless meals. Yea! I'm so glad you like the fritters and got to use your vintage shredder! My husband surprised me too when he liked them so much. Thanks for the link love! I need to try this recipe! My kids don't care of squash, but you never know when it's disguised! These sound really good! Thanks for the recipe! Alison, this is a very interesting dish! The Chipotle Mayo sounds like it would pull everything together nicely. Thank you for sharing with us at Monday Mania! Yummy! 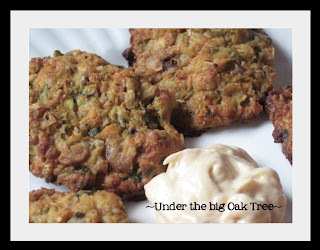 I love veggie fritters. Thanks for linking this to Two for Tuesdays! I saw that recipe on Gethealthycheap, and it sure looked nice. Thanks for stopping by Two for Tuesday. These look good! Great way to eat healthy and use some of the seasonal veggies! Those look great. I love using zucchini. Thanks for participating in Gluten-Free Wednesdays. I bet if you added lentils or beans you could eat these as veggie burgers too. But I love the fritter idea. I've been needing a recipe like this for awhile actually. Thanks so much for linking with me today!